Following up on the theme posted in March 2012, this is a guest post from Erin Taylor, Boston University student and 2012–2013 Intern to the New England Aquarium Conservation Department on the Phoenix Islands Protected Area initiative. In a series of posts she will share research on 19th century sperm whaling in the Phoenix Islands. This careful examination of whalers' log books, maps and historic whale distributions may help researchers studying sperm whale populations in Kiribati today. New England may seem a world away from the remote, tropical island nation of Kiribati, especially during these cold, gray months. However, a look back in time reveals a deep connection between the two areas. This is because Kiribati, and the Phoenix Islands, were at the center of vigorous efforts by 19th century New Englanders, particularly those of New Bedford and Nantucket, to hunt what were then considered monsters of the sea—whales. 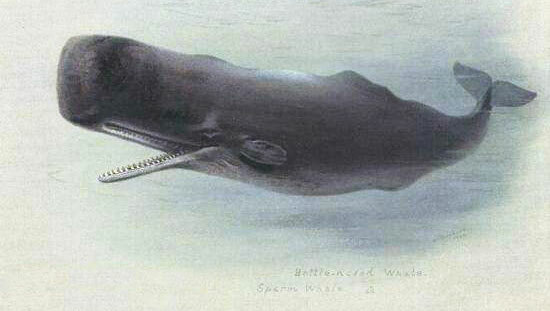 Sperm whales are what brought Yankee whalers to this region. These whales were prized for the gallons of highly valuable spermaceti found in the head of each whale. Spermaceti could be turned into high-grade oil for lamps and wax for candles. This pursuit turned into a global industry, which was a major fuel for the growth of a young United States. Hotspots for whaling were known as whaling grounds. Whalers shared with each other these locations where abundant whales were likely to be found. This information was invaluable, as voyages required a large investment of time and money, with trip lengths typically lasting three to five years. Whalers did not want return from voyages empty-handed. Kiribati and the Phoenix Islands were part of what were called the “on-the-line” whaling grounds—a prominent hotspot that stretched along the equator in the central Pacific. Map showing the Pacific whaling grounds | Map courtesy The National Archives, Kew. Though New Englanders began venturing into the Atlantic Ocean to pursue sperm whales beginning in 1712, it was not until the late 1780’s that they rounded the tip of South America and sailed into Pacific waters. It took another quarter century for American whalers to establish ports in Hawaii and for the first vessels to reach Kiribati waters. Word of the lucrative whaling potential in the newly discovered on-the-line grounds did not take long to reach the New England coast. By the 1840’s, 600 American vessels were operating in the central Pacific. 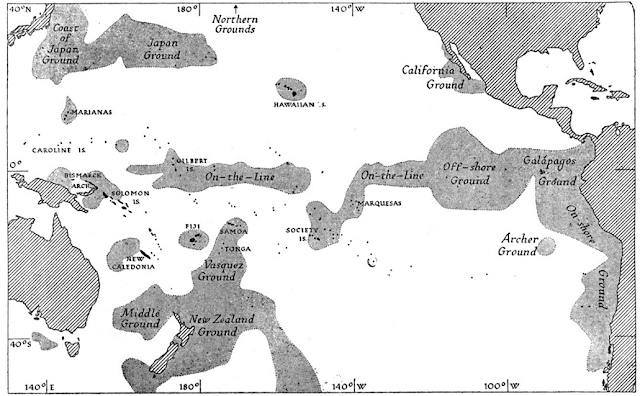 Estimates suggest that throughout the 19th century whaling era in the Pacific, a thousand whaling ships passed through the Gilbert Islands of Kiribati and the neighboring Tuvalu. 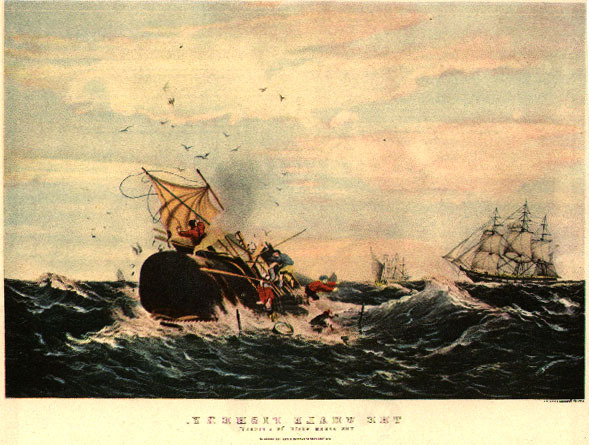 After peaking in the 1840’s and 1850’s, American whaling efforts declined due to a variety of factors, including increasingly scarce whale populations, a shift away from whaling to agricultural and mineral industries in the US, and the destruction of the labor force and whaling fleet during the Civil War. By 1870, the whaling industry had essentially died out in the region. Unfortunately, the aggressive efforts by New England whalers effectively decimated the populations of sperm whales in the waters surrounding Kiribati and the Phoenix Islands. Though nearly a century and a half have passed since the last Yankee whaling vessels sailed out of the on-the-line grounds, populations have not recovered to original levels. Recent expeditions indicate this once-abundant marine giant is now just a rare sight. In an effort to understand the reasons behind the slow recovery and the status of sperm whale populations in Kiribati today, the Aquarium is studying historic whale distributions in the Phoenix Islands using records kept by whalers in their vessel logbooks. By studying where whalers found whales—and where they did not—we can learn a bit more about baseline populations and compare them to the scarce populations seen today. So interesting and while whaling stopped way back in he PIPA area, sadly hardly a whale is seen these days. Another area worth studying is on the Exploitation guano also in the PIPA area.